Mini-Golf Build and Food Donation, a fun charitable team building program. During this CRS program, your group will design, construct, and play a unique and one-of-a-kind mini-golf course. 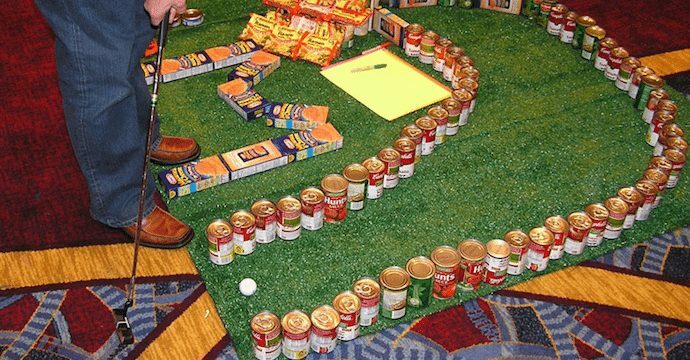 Your team will simulate those tricky bank shots, jumps, curves, traps, and holes all using canned and boxed food items. Players will create their own zany golfer nickname and construct their hole with its own theme and rules. In the end, after the course is built, an entertaining tournament ensues with scoring and fun competition. Both newcomers and experienced golfers will enjoy this event. After the competition, the course is deconstructed and the food is donated to a local food bank. Your team will feel a sense of joy while helping the less fortunate members of your community.